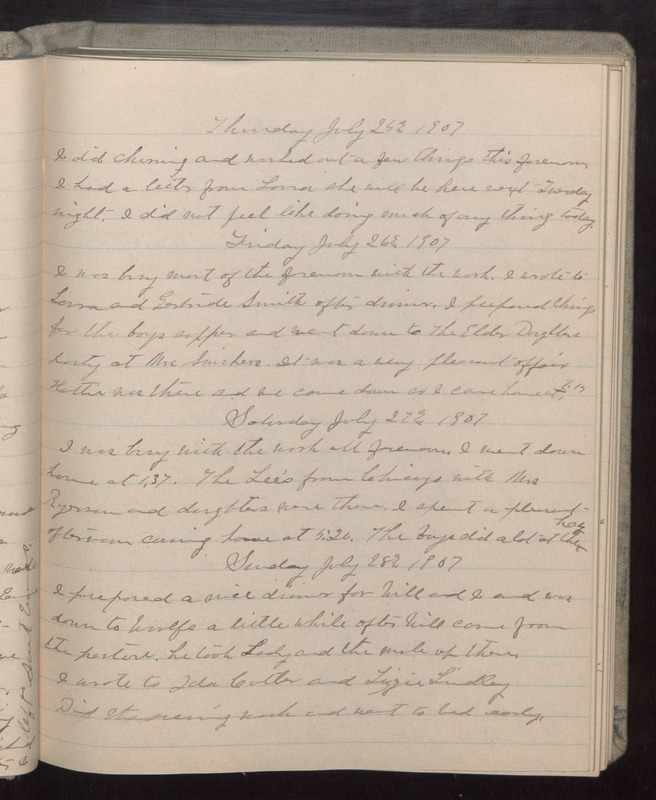 Thursday July 25 1907 I did churning and worked out a few things this forenoon. I had a letter from Lorna she will be here next Tuesday night. I did not feel like doing much of anything today. Friday July 26 1907 I was busy most of the forenoon with the work. I wrote to Lorna and Gertrude Smith after dinner. I prepared things for the boys supper and went down to the Elder Daughters party at Mrs Swishers. It was a very pleasant affair Hattie was there and we came down as I came home at 7.15. Saturday July 27 1907 I was busy with the work all forenoon. I went down home at 1.37. The Lee's from Chicago with Mrs [Ryerson?] and daughters were there. I spent a pleasant afternoon coming home at 5.20. The boys did a lot at the hog. Sunday July 28 1907 I prepared a nice dinner for Will and I and was down to Woolfs a little while after Will came from the pasture. He took Lady and the mule up there. I wrote to John Colter and Lizzie Lindley Did [illegible] work and went to bed early.